People counting, traffic analysis, data integration, driverless cars – these transformative internet-of-things (IoT) projects push Las Vegas to be a safer, healthier and smarter city. Join us on Nov. 15 to hear firsthand how Michael Sherwood, director of technology innovation for the City of Las Vegas, has helped the city create a program of innovation that benefits residents, visitors, local businesses and internal operations to make Las Vegas a smart city. You’ll hear examples of new technology being tested or proposed in the city’s innovation district so that the right technologies can be scaled out to the rest of the city. 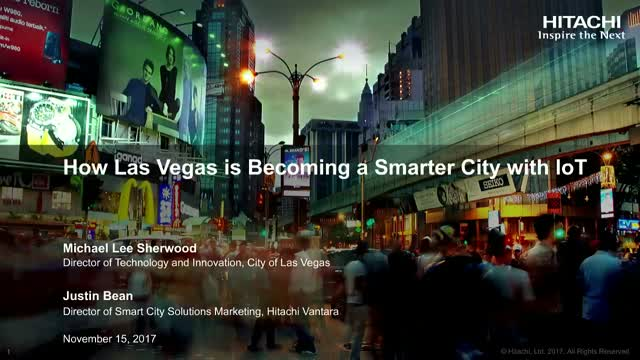 You’ll also hear how Sherwood has created a program that allows the types of rapid innovation that will help Las Vegas adapt to a changing world and help the community thrive.